Arginine has only comparatively recently emerged as an intriguing amino acid in animal metabolism. Following the establishment of its pivotal role in the urea cycle in the 1930s, arginine remained in the background for many decades. It was not until the 1990s that important developments were made with respect to its function as a precursor of polyamines and nitric oxide (NO). Many authors have yet to record these developments in their biochemistry textbooks. 3, argininosuccinate synthetase; 4, argininosuccinase. the concept that a pivotal role for arginine is the generation of proline (Basch et ai, 1997), polyamines (Wu et al., 1998) and NO (Lacasse et al., 1996) for optimal lactational performance. 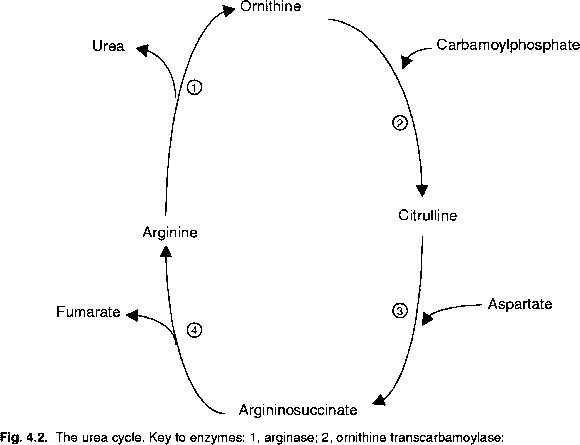 Remnants of the urea cycle may also be found in birds and reptiles, despite their reliance on uric acid as the major route of disposal of waste N. Thus arginase is found in the liver and kidney of birds, with higher activity in the latter organ. Avian kidney arginase is sensitive to dietary arginine status and antagonisms caused by lysine and certain other analogues (Chapter 7). The reaction is catalysed by various isoforms of NO synthase localized in specific compartments (Onoda and Inano, 1998). Thus, inducible (iNOS) and constitutive (cNOS) forms have been identified in the cytosol of porcine mammary gland (O'Quinn et ai, 2002). The cNOS isoforms are always present and generate intermittent low levels of NO. On the other hand, iNOS is activated by cytokines and endotoxins, and following induction, produces large and sustained quantities of NO. Barouch et al. (2002) referred to spatial confinement of neuronal and endothelial isoforms allowing NO signals to exert independent and even opposite effects on organ function. Reference has already been made to ODC, a key enzyme in polyamine synthesis. ODC acts on ornithine to yield the initial product, putrescine. Inputs from methionine then allow for the synthesis of spermidine and spermine (Fig. 4.3). Polyamine production appears to be an essential adjunct in all tissues that are actively synthesizing proteins. For example, polyamines act as mediators in the histological development of entero-cytes (Piva et al., 2002). Polyamine synthesis is also an important focal point for the action of certain antinutritional factors in legume seeds. In addition, the involvement of methionine in polyamine synthesis imposes competing metabolic demands, particularly when the tissue supply of cysteine is critical. A number of amino acid analogues occur naturally in plants used as sources of animal feed. These are structural analogues of certain nutritionally important amino acids. Canavanine contributes significantly to the toxicity of the seeds of the tropical legume, Canavalia ensiformis (jack bean). Poultry are particularly sensitive to the effects of canavanine since it is a structural analogue of arginine, an essential amino acid for avian species (see Table 1.1). In mammals, canavanine may be processed via a pathway that is analogous to the urea cycle (Fig. 4.4). The aromatic amino acid, mimosine, is an important toxic component of the tropical forage legume, Leucaena leucocephala. Although mimosine may be regarded as an analogue of tyrosine, the adverse effects appear not to be mediated via any antagonism between the two amino acids. 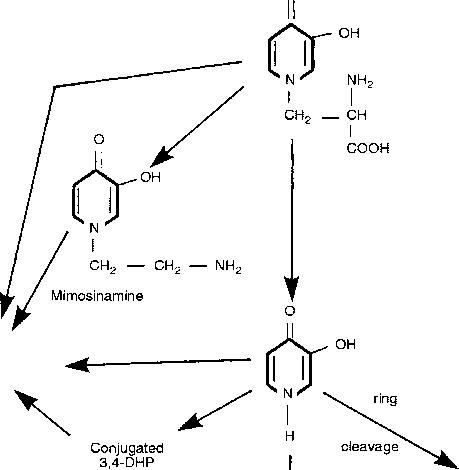 The pathways of mimosine metabolism have been extensively studied in the ruminant (Fig. 4.5) due to the widespread use of Leucaena as fodder. The toxic effects of a number of amino acid analogues including canavanine and mimosine are considered in detail in Chapter 7. Fig. 4.3. Action of ornithine decarboxylase in the initiation of polyamine synthesis. Key: 1, ornithine decarboxyl 3s6, DCAM, decarboxylated 5-adenosylmethionine.